Part One of our trip to Colorado started off a little shaky, as I once again was hit with altitude sickness. Gotta love that! I can however, whole-heartedly say it was totally worth it, again. After spending Wednesday night at Kels', we hit the Denver road Thursday late morning to Silverthorne. This is the part in the story where I have to point out reason number 9,487 why I know I married My Mr. Right. - Because Wes grew up with Mark. Wes & Mark are long-time friends. Mark went off to Colorado for college. In college studying photography, he met Michele, who was also studying photography. Flash forward to current and those two have been running a super successful husband & wife wedding photography business for over 10 years. Michele & Mark are two awesome people who I'm so fortunate to be able to call friends. Since the early days of starting this business of mine, Michele has been one of my strongest supporters. Through many emails and phone calls, she has coached, mentored and encouraged me. So, a few months ago when she offered that we come visit, hang out, talk shop, and shoot together - I was all in. Fortunately, Kels was also in the process of relocating from San Francisco to Denver, and we wanted to visit her too, it all worked out! Thursday afternoon, evening and night - Wes and Mark paddle-boarded and played with a flight simulator. While Michele and I sat around chatting about life, and photography. It. was. AWESOME. She is such an incredible gal who has a tremendous amount of knowledge and creativity. It was so inspiring and encouraging for me to talk with her face to face, and I learned so much!! After a day of talking shop, we spent almost all of Friday shooting together. And once again, I learned so much! Michele & Mark took Wes and I around to three of their closest places they love to shoot in, and each one was more beautiful than the last. 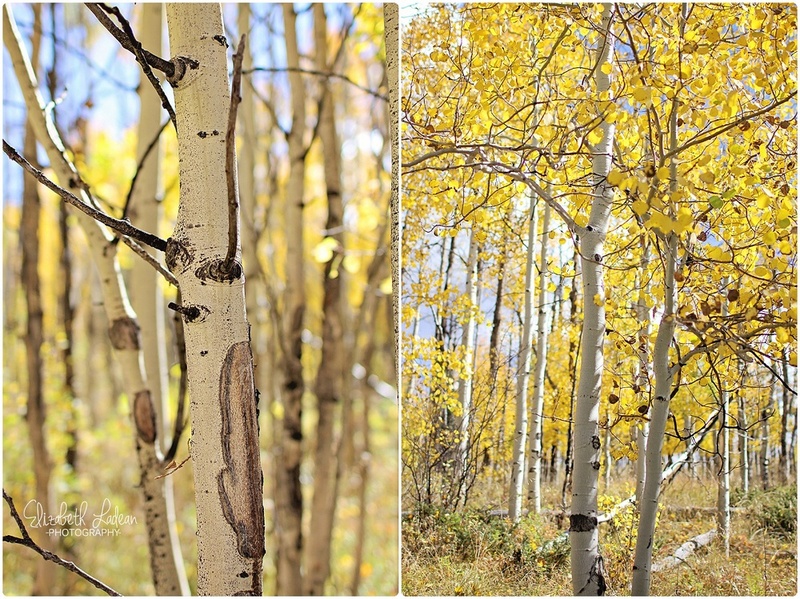 Fortunately for us, we had come to Colorado at peak time for the aspens to be in full color. I've LOVED these trees since I was young, so seeing them in person was truly a life-moment for me! Michele & Mark took photos of us, and I took photos of them, it was the best! Wes even snapped some images and let me tell ya, my husband knows some stuff! I was in heaven with these locations, I could have stayed in those aspen groves for days!! And to be taking photos of such an amazing duo of photographers was an honor! All images of Wes & I together, the credit goes to the amazing Michele & Mark team. I love these so much!! Images of just me are to the credit of all these awesome people! Michele & Mark - I really can't thank you guys enough. These two days were in so many ways just what I needed. A special thanks to Mark for keeping Wes entertained so Michele and I could chat & shoot shoot shoot! - Endless Thank-You's to Michele for the ongoing, support, encouragement, mentoring, and especially friendship. You've given me so much to build from! Lastly, a special Thank-You to my amazing husband! Thanks for meeting Mark as a kid! Haha. And for introducing me to these guys years ago. For being a wonderful bag-carrying, gear-holding and curiously-photo-snapping-husband. You are the best! Our first stop was Acorn Creek! - A gorgeous spot with a ton of aspens and mountain views! Our last stop was simply a little aspen grove near Dillon Valley.. A road that seemed to go nowhere exciting - turned out to be one of the most amazing areas I've ever seen! I could have spent hours here, and been perfectly content! AHH!! This place is the things my dreams are made of!! I mean seriously?! Does it get any better?! AHH!! Favorite shot of the entire trip!! - I love these guys! Working on our SERIOUS FACES.......and then losing it completely..
Michele is amazing!! I loveee this shot of us!! See more posts of B&W travel!